Both of these Catalina ads for men are from 1956. 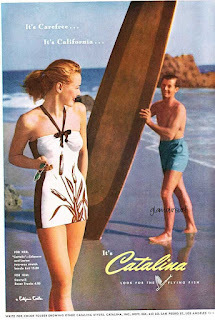 I kind of love the caption: The man Wears Catalina. 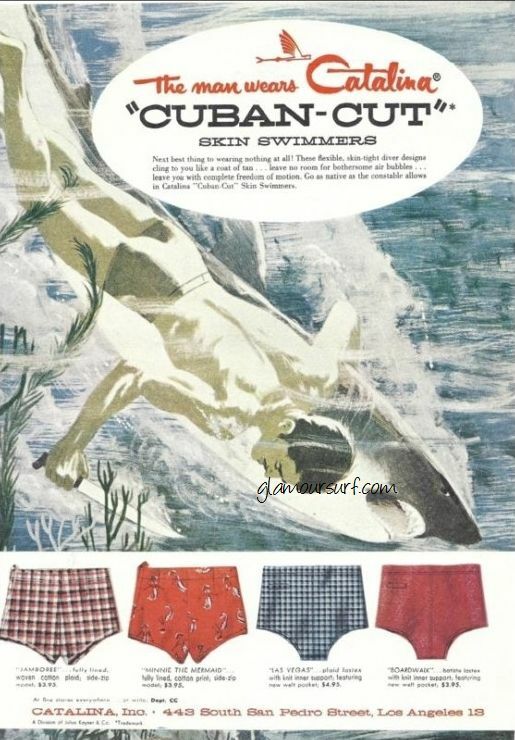 And the Double Header part was for reversible swim trunks. "Inspired by Janus the immortal two faced god, our new "Double Header" swim trunks are doubly good looking... give your beach wardrobe twice it's versatility. You can wear them inside out or outside in... they give you two smart swim trunks for the price of one. 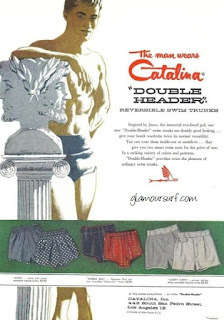 Double Header provides twice the pleasure of ordinary swim trunks." And how about the 'Cuban Cut". 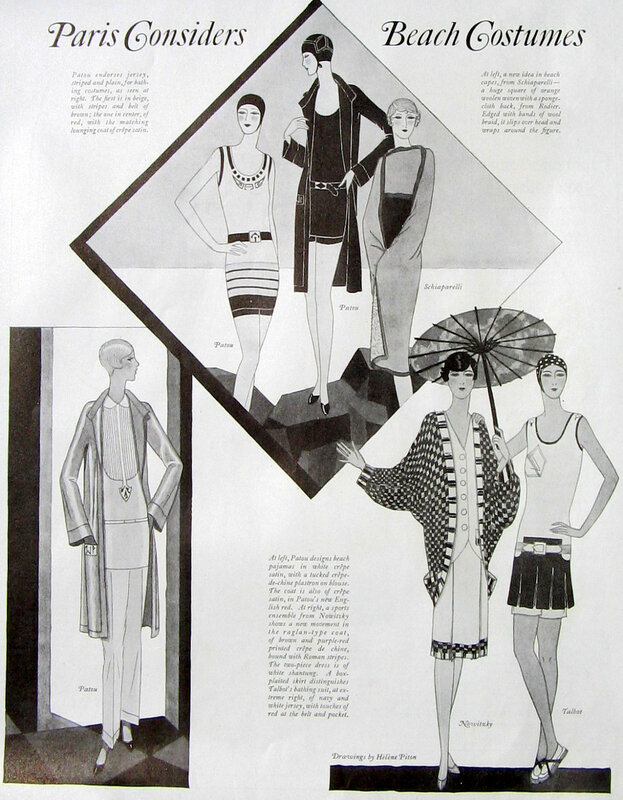 The copy reads "Next best thing to wearing nothing at all. These flexible skin tight diver designs cling to you like a coat of tan...leave no room for bothersome air bubbles...leave you with complete freedom of motion." Bothersome air bubbles... ha! That's going to be playing with my head all day. Fabulous right? 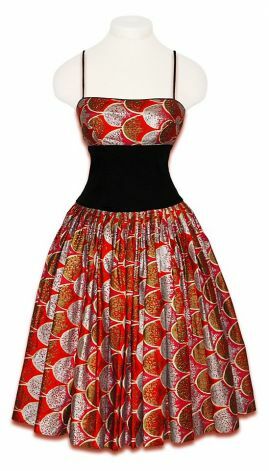 And maybe just a small bit of inspiration for your vintage Halloween get-up. 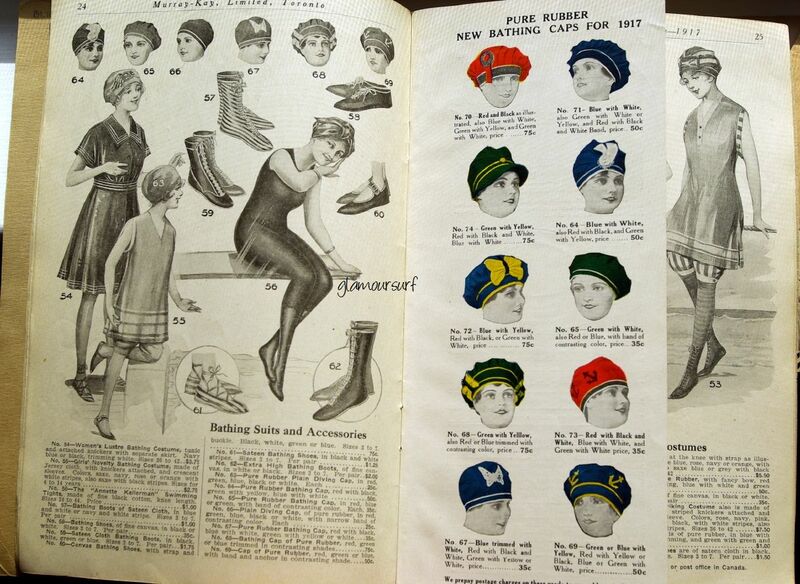 At least you would have in 1917, when swimming was called bathing and every gal needed to be covered from head to foot. Well, your arms could be exposed but that was about it. A rubber bathing cap, bathing boots or bathing shoes, a bathing suit and stockings were all needed to go in the ocean or lounge at the beach. 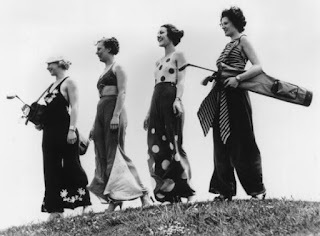 Quite a change when you consider some of the skimpy bikini's of the 80s and 90s and today wouldn't you say? Marilyn Monroe in a Cole of California swimsuit circa 1948. This is such a nice color and cut for her don't you think? We've got this suit in black listed on our site Glamoursurf. It was designed by Margit Fellegi, swoon! Yesterday we shared a couple of images of Marilyn in a bikini from 1951, photographed by Earl Theisen. Today we share another by the same photographer, Marilyn in the same suit (and shoes) without the jacket she was wearing. And Look! That bikini has side laces, even more risque. My guess, and it's a guess, is that it's a Catalina. But whomever was the manufacturer was, the bikini swimsuit looks stunning on Marilyn wouldn't you say. Thank you Earl! Today for our Marilyn Monday post at GlamourSplash we're sharing a couple of stumper shots. Yep that's Marilyn alright, and those are her shoes that we see so often when she's modeling swimwear. But, check out that bikini! The year is 1951. 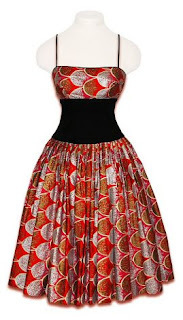 Very risque for then, not the high waist style bikini you would typically see in the 1950s. And look at that string top! The photo's are by famed Photographer Earl Theisen. Come back tomorrow for another surprise on this swimsuit. 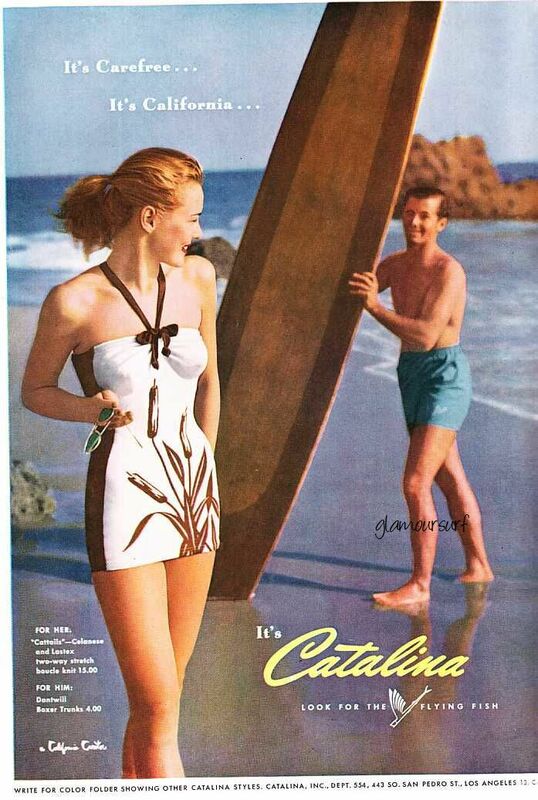 This image of Marilyn is from 1950, she's got that so come hither look, and how about that swimsuit? Here's another retro styled high waisted bathing suit, this one is from Bottega Veneta MSRP $520. Paired with a Chanel tweed jacket, Dolce & Gabbana wristlet bag. What do you accessorize your bathing suit with? Do you collect postcards? I sometimes will pick one or two up if they have something of interest for me. These two I found recently had swimwear, so naturally they came home with me. The postcard above is for the Ramada Inn in Bangor, Maine. I was a little surprised to go online and see that this particular hotel is still in business. The reviews, not so great, most of what I read had to do with 'needs updating', or 'smells musty'.No surprising I guess. 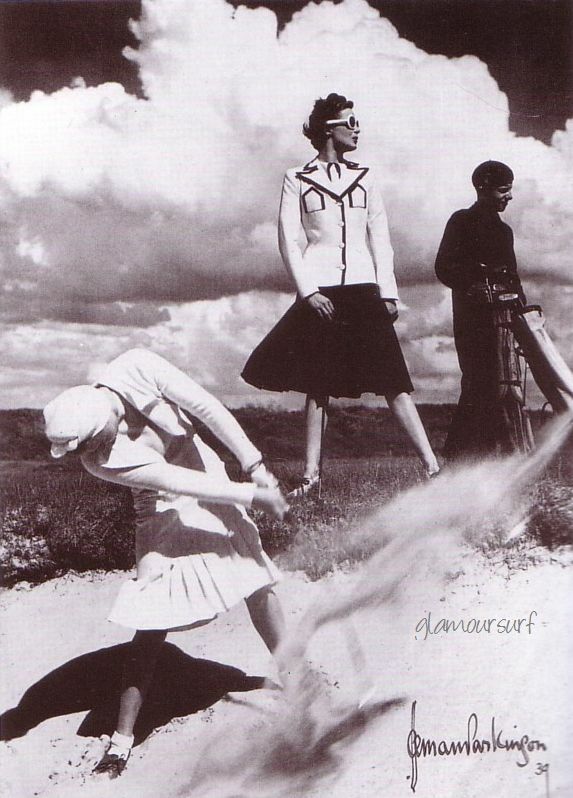 But the postcard is indicative of the times. The 1970s. check out the swimwear, and we all need a waiter who wears a tam-o-shanter right? The next one is from the Ambassador Inn in West Sacramento, Ca. which is now a senior apt complex, my how times change. But come now, who wouldn't want to lodge here from images such as this? What's interesting to me is the similar graphics on both cards, the layout, the photo's the mosaic type white lines.